This past Friday, I spent some time cleaning up my garden a bit. Some people don't care for yard work, but for me it is pure therapy. I love every aspect of it -the immediate visible results, the workout, being outside and getting dirty. 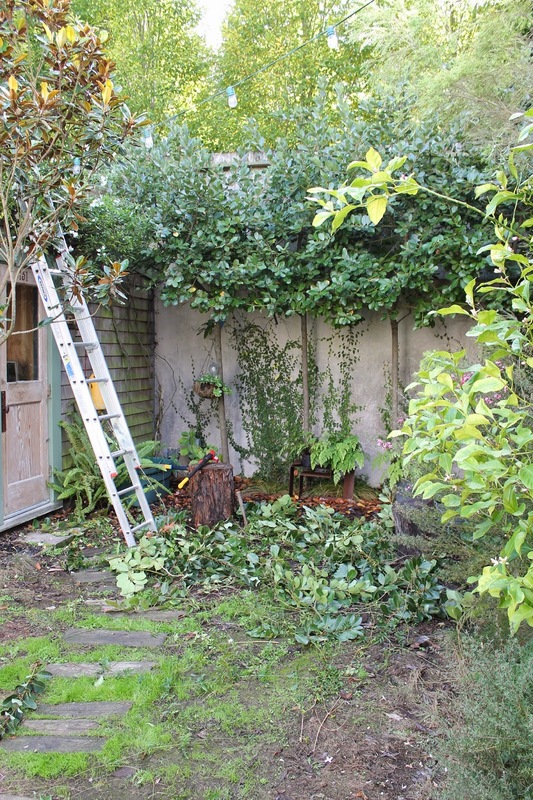 My first priority was to trim back this creeping fig. The suckers on this thing can be pretty damaging to wood over time so I try to keep mine confined to the concrete retaining wall under the wood fence. Also the jasmine vine above it had some wily offshoots that needed training and trimming. Check out my neighbor's incredible cypress tree that is two yards over. That thing is so majestic and must predate every house on the block. It also attracts the wild parrots that are colonizing Sutro Forest which is just a few blocks west of where I live. The parrots are kind of loud and squawky but I find the fact that wild parrots now live in SF to be so exotic that I kind of like it. In case you're wondering why that fence looks so high, it is because it is! 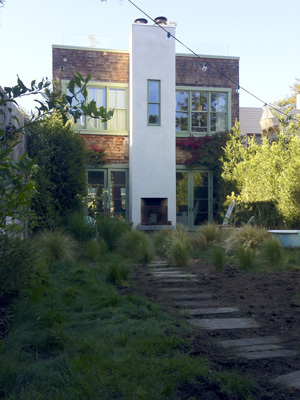 My house is on a slight hillside sloping in two directions and we wanted a flat walk-out yard, so the yard was excavated when we built the house. Funnily, our neighbor has since done the same with his yard so that fence doesn't really need to be that high anymore, though still necessary because his grade is still about 5 ft higher than ours. I also pruned back the row of trees at the rear there, which have really taken off in the last year. My long term goal for these trees is to shear them into a boxy hedge at their top, so I keep cutting them back to create bushiness. 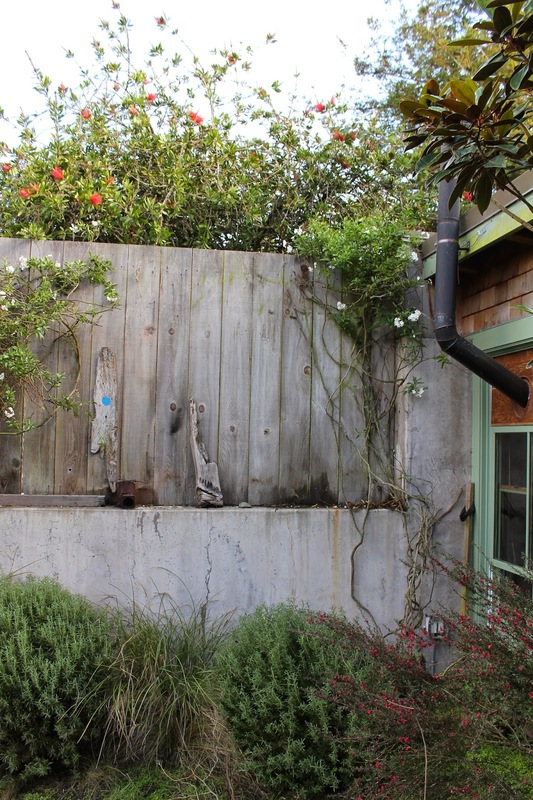 Ok, confession time: I almost killed that poor potato vine early in the summer with a clearly too extreme hack attack. I have only had potato vines thrive by cutting them back (ordinarily they love it) but obvs this one was too much as it is only now starting to recover. My guess is that the lack of water (I barely watered this summer because of the draught) and the drastic haircut were just to much for it. Here is a glimpse of it from much healthier days. 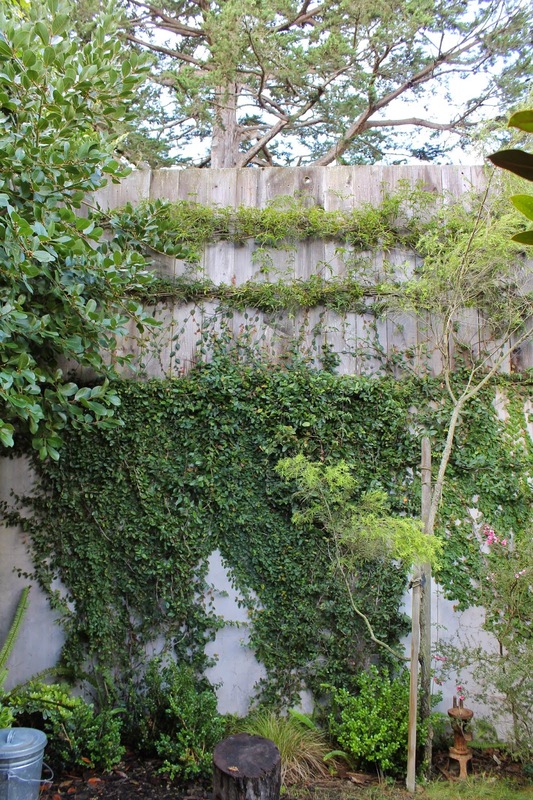 Seems like the creeping fig is finally going to take off and fill in on that north wall. I hope it rains this winter because those things like a bit of water to grow and I'd love for that to finally friggin fill in! I finished the yard work sunday morning Just In Time! Because we got our first snowfall. Around here it's leaves - raking and filling leaf bags ...i must have filled 20 bags. My neighbours all have yard services or leaf blowers but I still do it myself: raking and bending. You and I would make good neighbors. My pet peeve is chain saws. Whenever I hear one I go into a tizzy -worried that some dumbo is cutting down a big one in their back yard. Thankfully it seems the parcels are too small here to warrant a leaf blower and most trees in sf are evergreen anyway.